Occasionally, I would give each student a sticky note as they left my table following their lesson, and instruct them to record a connection they made while reading the assigned pages. I would model, too, of course, but it never failed... some students would return the next day with a weak connection like "This book reminded me of Because of Winn-Dixie because both books have dogs." scribbled on their sticky note. While that is a connection that cannot be denied, it was a simple connection- there wasn't much deep thinking going on. 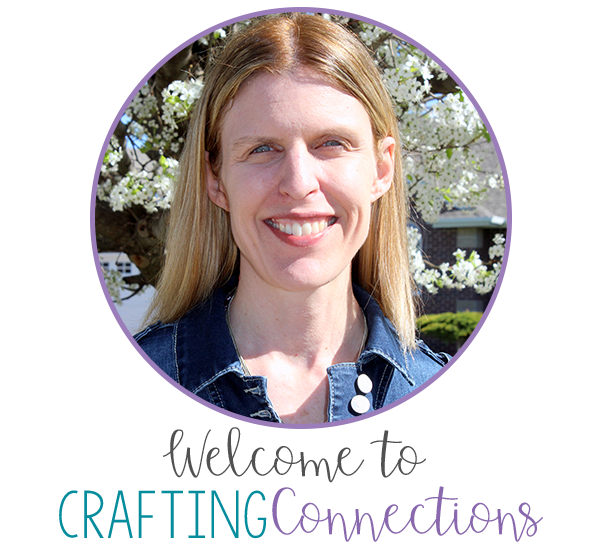 I know students are taught to make connections while they read as early as kindergarten, so by the time they are in fourth and fifth grade, I think they should be able to take it up a notch and make some deeper connections. Wow! 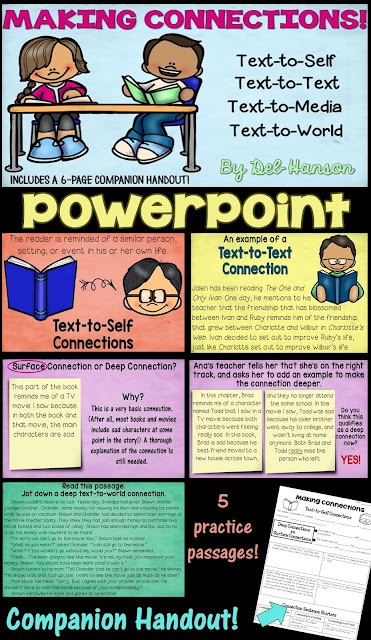 I wish I would have run across this idea when I was a reading teacher! My students could have definitely benefited from this lesson! I truly believe that this visual experience would have stuck with my students even more than my repeated attempts at modeling well-written connections. I am confident that the differences between surface connections and deep connections would have finally "clicked" with them! The next time I have an opportunity to facilitate this lesson with students, I am going to hang an anchor chart that can remain on the wall long after the lesson. I also intend to have students add a page focusing on this important skill in their interactive notebook. Feel free to download this page if you would like to use it, too! Border by Kelly Benefield. Container by Ashley Hughes. 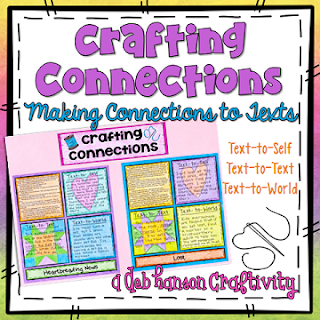 If you are looking for some ready-to-go resources for teaching your students about making deep connections rather than surface connections, feel free to check out my PowerPoint and craftivity. It includes many examples of surface connections, along with revised deep connections. Just click on the image to check it out! Do you have a tried-and-true method for teaching students how to make deeper connections when they read? I would love to hear about it! Amazing!!! Yes those simple connections drive me crazy!!!! Now to find a golf ball and a ping pong ball! This is a great idea and super chart! Totally pinning it! I love this!! What a great visual! Thanks! Hi Deb! I ran across your charts and post and was astounded! This lesson with two golf balls--one a normal golf ball and the other a child's hollow golf ball--dropped into a clear cup of water sitting on top of a text, was an original idea of mine that I shared with a number of classes of teachers that I taught back in 2011 - 2013. The teacher of The Second Grade Superkids attended one of those courses. I never knew that she posted about this . . . and you too. 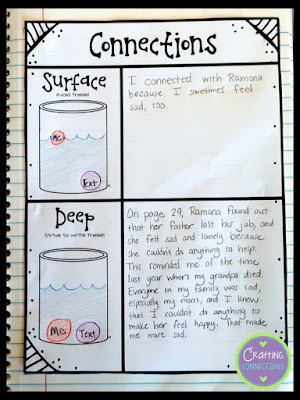 It was and still is a very powerful lessons that allows my young students to see the difference between "surface" connections and "deep" connections that bring us closer to the text. I strongly support launching lessons that are more abstract in concrete ways! I wish you the best . . . more effective teaching as you strive to connect with the students that you guide toward deeper understandings of the books they read. Hi Janet!! 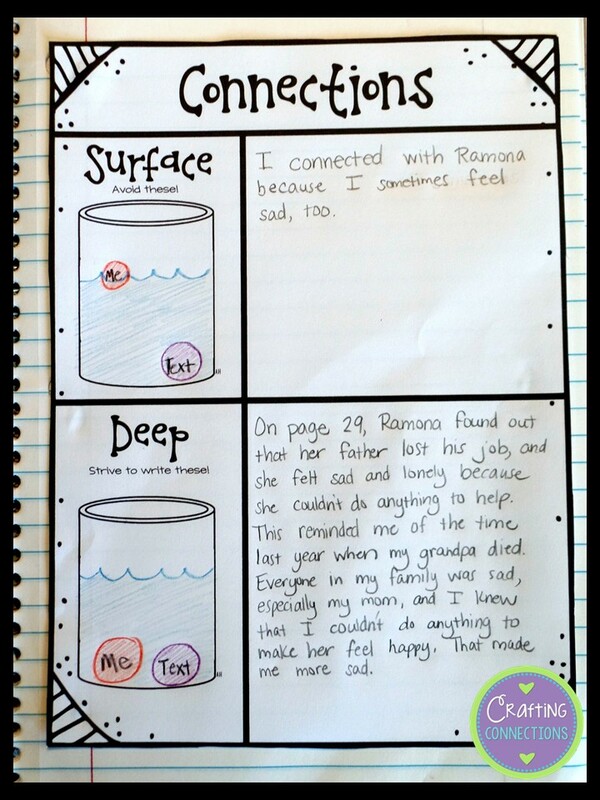 Thank you so much for taking the time to write to me and let me know that you were the creative teacher who came up with this fabulous idea for teaching about the difference between deep connections and surface connections! I absolutely love it! I, too, love to take abstract concepts and try to make them concrete for my students as much as possible. Thank you again!